The Republican governor said he could get behind a few proposed regulations that arose from the second day of discussions on school and gun safety after a fatal shooting in Santa Fe. After the second day of discussions on school and gun safety in the aftermath of the Santa Fe High School shooting last week, Gov. Greg Abbott on Wednesday listed several gun-related regulations he said he could support. 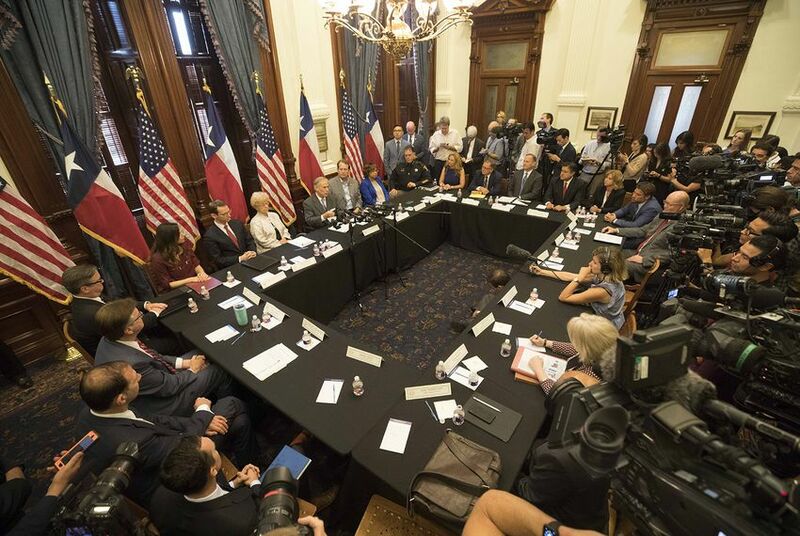 The Republican governor met with several lawmakers, mental health experts and advocates on both sides of the gun debate to discuss ways to prevent another mass shooting in Texas. After the three-hour, closed-door meeting, he told the press he could get behind regulations such as reporting the loss or theft of a gun and shortening the time period to report a mental health court judgment. Though he mentioned several initiatives that would require legislative changes, such as hiring more behavioral counselors for schools, he continued to avoid talk of bringing lawmakers back to Austin for a special session. He said he supported shortening that time period to at least 48 hours. Abbott also said all parties in the meeting agreed upon the importance of promoting the safe storage of guns. Other regulations discussed included improving background checks and “red flag” warnings, where authorities could take guns away from people deemed to be dangerous. Abbott repeatedly cited the need for due process in any case where someone’s gun may be taken away. Alice Tripp, legislative director of the Texas State Rifle Association, emphasized after the meeting the importance of due process, saying a court judgment after a crime would be needed before anyone’s gun could be removed. “You can’t lose your rights because your neighbor alleged that you were acting strange,” she said. Tripp, whose group is against further gun restrictions, added that she didn’t find much common ground during the discussion with the group that advocates for more gun regulations, Texas Gun Sense. As far as the proposals mentioned during the meeting go, she said she’d need to see any legislation before making any opinions. But Texas Gun Sense’s representative, Ed Scruggs, said he felt confident the governor would suggest several gun-related proposals after the discussions and the Santa Fe shooting. He was encouraged by Abbott’s openness to ideas that he said have gone nowhere in the Legislature recently, like reporting gun loss. And he’s hopeful any gubernatorial support turns into real policy changes. “I think if he does come out in favor of certain things, it is a positive signal to the Legislature,” he said. Many are more skeptical of what will come from Abbott’s discussions. U.S. Rep. Lloyd Doggett, D-Austin, criticized Abbott in a news release Tuesday for not including groups that have spawned from school shootings, such as Moms Demand Action and A March for Our Lives. He said any conversation without them would have minimal potential. Abbott said Tuesday that the results from the meetings show that he is already moving beyond just talk. “We came up with very solid solutions, and now it’s just a matter of implementing those solutions,” he said. Aside from potential gun regulations, Wednesday’s meeting focused on handling mental health challenges in schools. Suggestions that came out of the talk included implementing mental health screenings, trauma and grief programs and the agreed-upon need for more counselors. Though several of the initiatives would require legislative changes, Abbott continued to avoid talk of bringing lawmakers back to Austin for a special session. He echoed his comments from Tuesday, saying the current discussion was focused on substance, not process. Wednesday was the second of three days of scheduled talks that Abbott planned after the Santa Fe shooting that killed eight students and two teachers last week. In the meeting on Tuesday, Abbott touted changes that could be implemented immediately to tighten security and increase law enforcement presence at schools. He also mentioned expanding a school program that allows teachers to carry guns on campus. Abbott focused more on procedural changes Tuesday than ones that would require legislative approval, but he did float ideas that came up again on Wednesday, such as hiring more behavioral counselors. On Thursday, Abbott and other lawmakers — including Republican U.S. Sen. Ted Cruz — will hear from survivors and victims of recent Texas mass shootings, including the Santa Fe shooting and one from last fall in Sutherland Springs that killed 26 churchgoers. Almost 40 people affected by shootings were listed to attend. A spokeswoman for Abbott said Tuesday that the talks were off the record to allow for frank discussion from all participants. After the meetings, Abbott presented to the media a quick recap of the hours-long meetings. More than half of Texans polled wanted stricter gun laws. And that was before the Santa Fe school shooting.